In an afterword to this handsomely produced selection of tales, Alderson expresses his concern at the sterility of many recent translations of Grimm, and explains how he has attempted to preserve the atmospheric cadences of the oral tradition in which these tales are grounded. He has succeeded. This is one of the most enthralling collections of traditional stories that I have come across in recent years, on a par with the eerily riveting retellings of Susan Price. It has been a pleasure both to read and to share them. 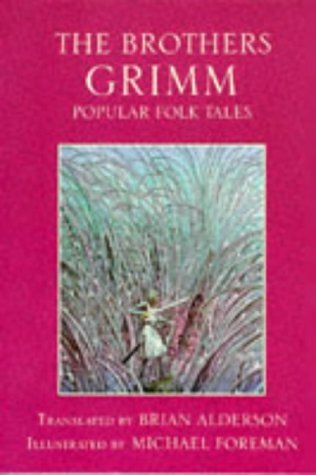 Familiar tales appearing here, such as 'Rumpelstiltskin', 'Rapunzel' and 'Snow-White', are re-enchanted with surreal and grisly little twists, while a clutch of lesser known tales gives us glimpses of bizarre riches still undiscovered (like the tiny, teasing, yarn that concludes the collection). Michael Foreman's full page paintings and his pencil drawings which head each chapter provide traditional visions flushed with sprightly new vigour, a perfect accompaniment to this new translation.